Australians flock to Whistler to zoom down its slopes, but if you thought the landscape was magnificent from the ground, imagine taking it all in from the sky. In winter the Ziptrek Eagle Tour whisks adventurers across five lines in a setting of frosted pines, with soaring mountains as a backdrop and a marshmallow terrain below. In summer it’s all babbling brooks and green as far as the eye can see. If the old-growth rainforest in Fitzsimmons Valley wasn’t enough to make this trip unforgettable, hurtling 30 storeys down the tour’s new 730-metre line is sure to do it. The three-hour escapade ends right in Whistler Village, so hit the hills once you’re done or head straight to a bar for après. 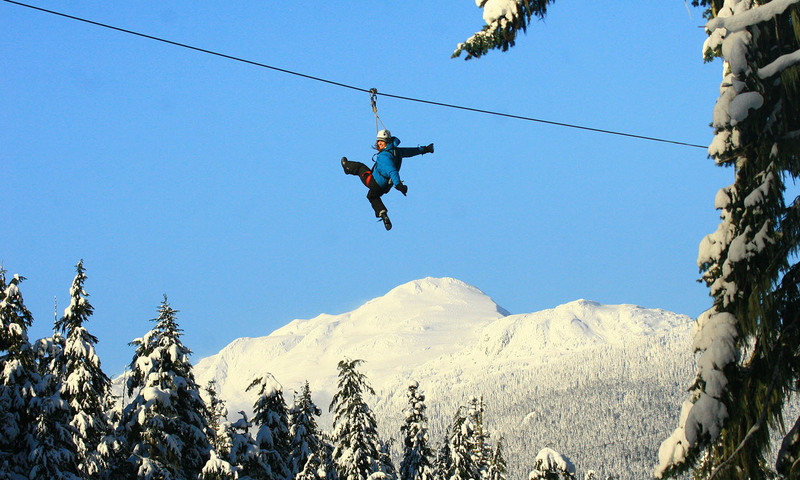 The five-line Ziptrek Eagle Tour in Whistler starts at US$90.